The right pantsuit has executive style. Trendy women's outfits and the latest fads are perfect for a night out on the town, but in the workplace, professional attire is often the best choice. If you have a job where you're expected to wear a suit, changing up your style can add creativity and versatility to your wardrobe without compromising an overall conservative feel. Just because you wear a suit doesn't mean you have to look frumpy or out of style -- many executive styles are appealing and well-suited for the office. Always ensure that clothing is well-fitted -- not baggy or overly tight -- and choose trim, flattering designs over flamboyant ones to showcase you, and not your clothes. A tailored pantsuit is an executive alternative to the traditional skirt suit. 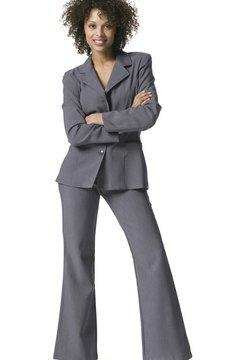 To maintain uniformity, it's best to choose a pantsuit that has a matching jacket and pants. Colors such as grey, black, off-white, navy blue, olive, taupe, beige and brown are generally the most conservative. If your workplace isn't ultra-conservative, brighter colors, such as deep red, dark purple, springtime pastels and bright white are also desirable. For a fashionable twist to a professional pantsuit, choose a flared or boot-cut pant leg and a jacket with a trendy four-button closure. Avoid rounded jacket collars for a "hipper" more youthful design. A tailored suit skirt is an attractive way to showcase your femininity. Straight skirts, often known as pencil skirts, and skirts with A-line shapes are generally the most conservative and the most visually appealing. In general, a tailored jacket with long sleeves looks more professional than an unconstructed jacket with short sleeves. Career Services at the University of Tennessee recommends wearing a suit skirt that's knee length, isn't too tight and doesn't have high slits. The goal is to look attractive and professional, without appearing immodest. 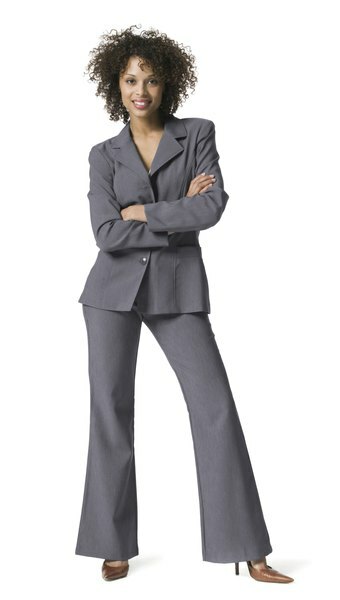 Mix-and-match pantsuits and skirt suits are also acceptable styles for executive women, depending on the office culture. For example, spruce up a pair of solid black or grey slacks with a crimson-colored jacket or an off-white blazer. Choose a teal jacket to complement a pair of navy blue slacks or a black skirt. Pair a dark-colored pencil skirt with almost any jacket in the closet. Mixing and matching allows you to create new professional wardrobe styles without spending more money on clothes. 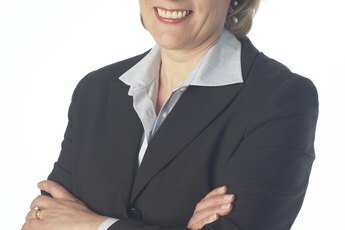 Forbes.com recommends that every executive woman should own at least one pair each of gray flannel, brown and black pants. A versatile suit option is the dress and jacket style. Pairing a straight, full or A-lined dress with a coordinating jacket is an eye-stopping way to add versatility to your wardrobe. Dress and jacket suits are available as sets, or you can purchase the dress and the jacket separately. A solid colored dress has a wide range of options, so choose different jacket styles, colors and lengths to expand your wardrobe options. For example, you could a pair a black dress with a light-colored jacket with black piping or choose a black-and-white houndstooth blazer. Both have executive style. The dress and jacket suit is perfect if you need to go straight from the office to a restaurant; just remove the jacket and add a brooch or string of pearls and you have an attractive, executive-quality dinner outfit.